"Through my role in the SSL I have had the opportunity to speak at open days and represent the school at various events. It is incredibly rewarding to be able to make a tangible impact on the school and the wider community. Our weekly meetings are a great chance to discuss new ideas to enhance the 6th Form experience for students, as well as an exciting opportunity to organise fun social events." "The SSL gives us 6th Form students the ability to shape our 6th Form experience by organising social events, feeding back students opinions and representing the school at events. Not only are we able to make an impact on the school, but through our roles and responsibilities, we are able to develop essential life skills such as public speaking." One of the other features that makes our 6th Form outstanding is the way we develop our students as leaders, make sure their voice is heard and act on what they have to say. We feel that students are more engaged in the 6th Form if they feel involved in shaping it. Students can apply to be Head Boy and Girl, Deputy Head Boy and Girl, Heads of House, deputy Heads of House and other senior student leadership positions such running 6th Form events, charity fundraising, mentoring and organising clubs and societies. The Head of 6th Form meets with the senior student leaders every week to consult with them on a variety of matters concerning A-Level students, such as how we should best recognise student achievement in the 6th Form and how we might support students who are struggling. They enjoy and make the most of this increased autonomy. Our 6th Form students want to make a difference in the world and our 6th Form has its own charity it supports every year. The senior student leaders play a big part in fundraising and coordinating form charity events. The charity St Marcellin’s is in Zimbabwe and is home to orphaned and abandoned children. It receives no state funding and they are working towards self-sufficiency. Over the course of the year each tutor group organises activities and events to raise money such as charity football and bench ball tournaments, quizzes, raffles and Valentine chocolate delivery. It is great to have our own nominated charity where we know the money goes directly to the people who need it and we are very proud of difference we have made to the lives of the children in Zimbabwe. 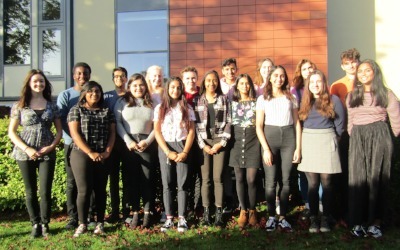 "The Senior Student Leadership team aids the transition of the new Year 12s into the 6th Form Community, as well as making the experience as efficient and enjoyable as possible. I have helped plan and organise socials, as well as listening to suggestions and ideas from the rest of the 6th Form and feeding back during meetings." "On the Senior Leadership Team we work on improving the experience for the 6th Form through weekly discussions and the events / socials we hold. What I enjoy the most is being able to participate in improving our experience at Nower Hill 6th Form and creating the best memories." "We plan and run socials, come up with solutions to issues within the 6th Form, such as long lunch queues and how to share the music in the common room, and finally we try to make the common room a more sociable place by adding games such as table football. I enjoy getting the chance to put forward both my peers and my own ideas for the 6th Form and actually seeing them being implemented."